The thermometer finally ducked below 70 on a weekday evening last week (hooray! ), which meant that I could finally, at long last, get my bakin’ boots back on! The very sight of Trader Joe’s newest baking mix made my blonde self bubble over with baking joy! So when I saw that Trader Joe’s now makes a Blondie Bar baking mix, I audibly yelped with glee. I love chocolate chip cookies, especially the super-chewy ones, but chocolate chip cookies that are chewy AND in the consistency of a brownie-type bar call out to me like nothing else. While some might call these “toll house bars,” real bakers prefer Blondies. My mind immediately went to all the munchiful mix-ins that I could pair with the Blondie: Nuts, dried fruits, other baking chips. Or, how about a trifecta of one item from each category? Of course, I didn’t want to overdo it or mix in too much to ruin the Blondie consistency either, so I made sure to restrict myself based on what the box mentioned for their recommended mix-ins (1/2-cup total additional ingredients). This was my Blondies mix after I added my Aloha-goodness. I came to my final decisions based on C’s query of the day: He asked me what I thought if our family was to go to Hawaii for a few days around the holidays? Aloha? I thought he was talking crazy for a second, considering that the holidays are probably the hardest time book Hawaii (not to mention the most pricey). But he of course asked me to sit down and review our hotel points and airline miles balances; I don’t know how it penciled possible, but it did. We had enough of each accounts for the three of us to fly there and back AND stay for free at our favorite spot on the Big Island. Well, then, Aloha, here we come, and Happy Holidays! And with that, here is my tropical tweak on the Blondie Bar. Mahalo, and you’re welcome. 1. Prepare Blondie dough as stated on box of mix. 2. Combine together the coconut, white chocolate chips, and macadamia buts in a bag or bowl; keep your 1/4 c. measuring cup nearby. 3. Fold in ½ c. of the mix-in mixture ¼ c. at a time. Reserve the rest for later. 4. Return to TJ’s mix directions, spreading dough in pan and baking as recommended (I baked for 28 minutes for chewy consistency). 5. Cool Blondies on wire rack for 10 minutes, I inverted the Blondies onto a cutting surface and sliced into squares. As I used a 9”x9”x2” pan (an 8”x8”x2” pan is recommended, but I don’t have one; the slightly larger size was just fine), I cut into 36 small squares (6×6) for smaller portions than the 16 servings as listed in the Nutrition Facts. My oatmeal the next day was very happy, and so was I. Those leftover mix-ins from my Blondies wasn’t just an accidental overage, RMT’ers! As for that extra ¼-cup or so of mix-ins that we didn’t use in the recipe above? You can always save it for another baking session. Or, you can do what I did and mix it into a bowl of oatmeal the next morning at breakfast. Ono-kine indeed, RMT’ers! I reused a used-up parchment box as a small baking gift box for T’s teacher. The report card back was that the Blondies were delicious. She also gave my packaging idea high marks, so high in fact that she told me I’ve earned me a special role in their reuse-reduce-recycling curriculum come this spring. Well, I’d better practice a few times more if that’s the case, as wrapping this box took about as much time as it did to bake the Blondies (I’m not joking). While I didn’t take the baking box idea to its full potential with a reusable button closure, I found that a strand of curling ribbon worked just fine for those (like me) who might be chock full of ideas but very short on time. Oh, and wondering where I came up with the idea of the cute box to pack some of these tasties up for T’s teacher? 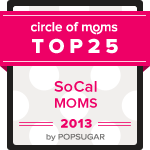 Check out 24/7 MOMS for this and other inspiring ideas. While I didn’t take my box as far as theirs with the super-amazing elastic closure with button (seriously, it took me about as long to wrap the box as it did to bake the Blondies after all! ), the photo still inspired me to reuse that used-up parchment paper box at the end of the baking session in a way I might otherwise not have. Now that’s what I call a gift that keeps on giving! What’s baking with you, RMT’ers? This entry was posted in Recipes and tagged 24/7 MOMS, baking, baking mix, blondies, box, chips, dessert, foil, Hawaii, Hawaiian, macadamia nuts, recipe, recipes, reuse, salad in a jar, shredded coconut, Trader Joe's, white chocolate. Bookmark the permalink.